To see 2015's Imbolc altar, click here! The midpoint between the longest night of the year and the beginning of spring, February Eve celebrates the first stirrings of regrowth underneath the ice and snow of winter. Those who connect with deity may associate this holiday with the Irish goddess Brigid. Given sainthood in Christianity, Brigid represents the sacred flame and is said to visit homes and bestow blessings of growth and prosperity on those who leave her offerings. For those who may lean more towards Wicca, this holiday represents the Goddess in her maiden form waking barely stirring in her sleep and the young god opening his eyes. As a nontheistic witch, I see this as a time of new beginnings, or fresh starts. Out with the old and in with the new. The fire elements involved with this holiday burn away the useless and unnecessary, the old and unneeded. With this in mind, my altar reflects these meanings. Betrayed in its simplicity, my altar represents far more than meets the eye. Stay tuned for a special usage and gorgeous photos from that towards the end! The simple adornments around the center of the altar represent the standard icons of Imbolc: Ice and purity represented in quartz and fire represented in candles. Above the altar hangs the same wreath as seen in above my Yule altar, connecting this sabbat with the two winter sabbats of the year. That wreath is decorated with glass beads for reflection, LED lights for humanity and snowflakes for tranquility and individuality. These have been strong themes in my life this winter and I felt it was necessary to continue them to February Eve. This is also why I utilized a similar color scheme and layout from Midwinter. The star of this altar, however, is my continuation of my Imbolc in a Cup tip from 2013. Originally starting with bay leaves in a glass of salt, it has evolved immensely over the years. This iteration is far bigger than previous years with purpose. 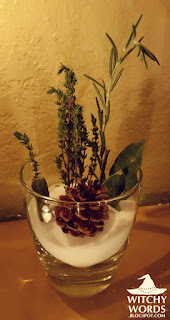 Prior years utilized bay leaves for wishes, thyme for banishing, rosemary for remembrance and pine cones for prosperity. 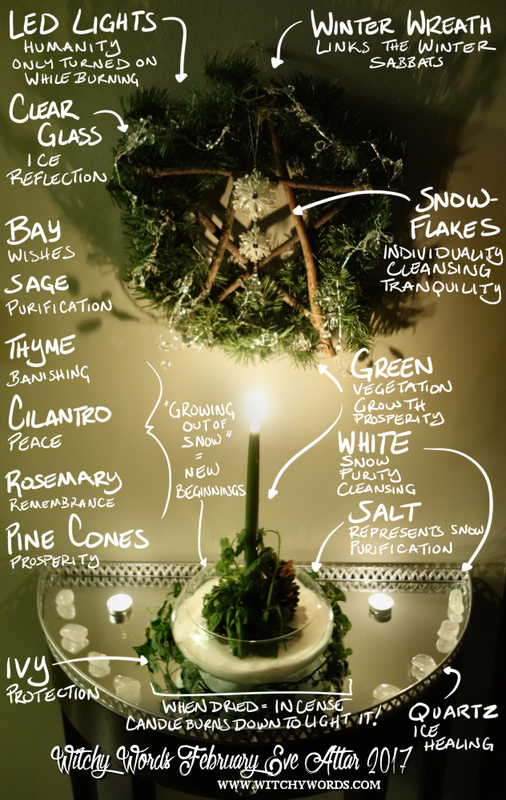 This year's adds sage for purification and cilantro for peace, all freshly wrapped around a tall green taper. For those who may struggle to see the connection of this to Imbolc: Salt has a history of purification uses. Similarly, the snow is seen as purifying the earth, making way for the new. The salt represents the cleansing properties of snow. 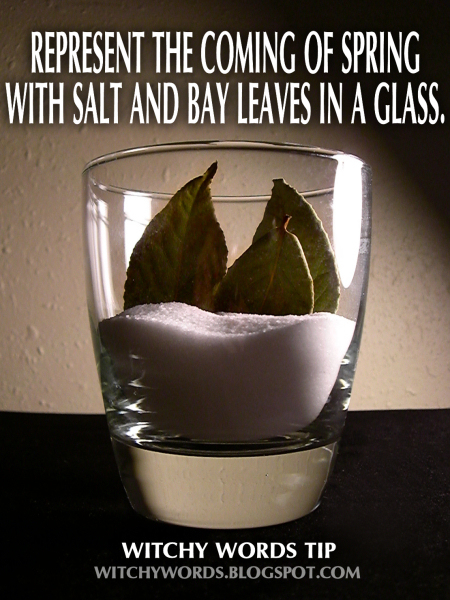 Bay leaves are often used for wishes. Wishes are the start of something new, the beginning. Wishes turn into hopes turn into goals which turn into plans. The bay in this situation represents just a green few leaves poking out from the snow, the beginning of something new. Other herbs, such as pine cones for growing prosperity or sage for purification, were added to represent these things during this season. Overall, it’s a simple way to represent new, freshly grown green leaves in the snow visually while connecting to the purification of winter and the new life of spring. It’s a secular pagan perspective on Imbolc. Allowing the candle to burn down until the herbs caught. This year's Imbolc in a Cup doubles as a special February Eve cleansing incense! I then carried this about my house, cleansing every room with the smoke. For something so simple, it was so gorgeous to watch. With that, my Imbolc altar was complete and cleared for the next sabbat. Enjoy below a visual explanation of the altar for quick reference! I hope everyone had a blessed February Eve!